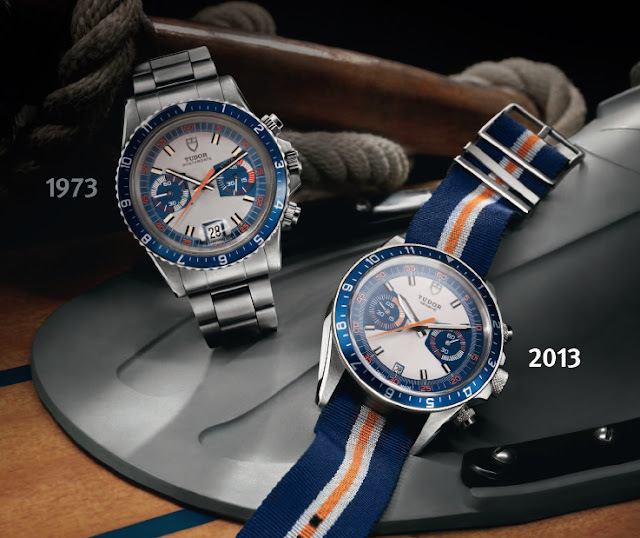 The Tudor "Montecarlo" chronograph was launched in 1973 and soon became one of the most successful Tudor watch. Available in a number of different versions, it was produced for only a few years making it even more desirable to collectors. At BaselWorld 2013, Tudor presented a reinterpretation, not just a replica, of that historic chronograph. In fact, Tudor made some changes to the original design with the intention to update the original model to the modern times. The new Tudor Heritage Chrono Blue (ref. 70330B) is defined by its vibrating colours, blue, grey and orange. The dial has three-dimensional hour markers with two bevelled metallic edges deﬁning an area ﬁlled with SuperLuminova for optimal legibility. The two sub-dials, one at 3 o’clock for the small seconds and one at 9 o’clock for the unusual 45-minute counter, are located inside two blue trapezoidal shape. Waterproof to a depth of 150 mt, the steel case has a diameter of 42 mm (compared to the 40 mm of the 1973 model). 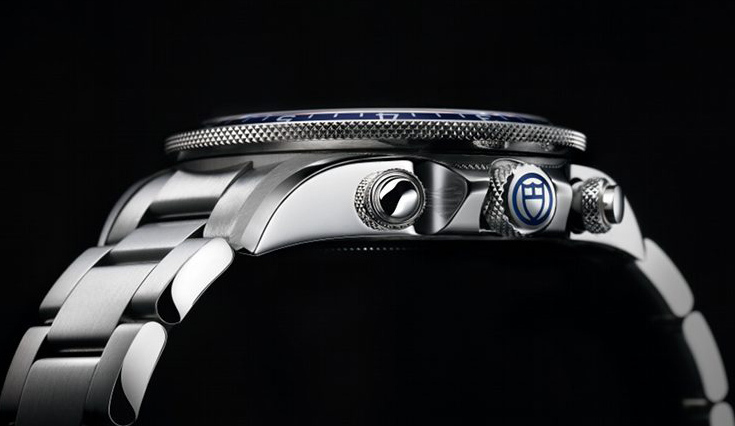 The rotating bezel is bidirectional with a blue anodised aluminium insert. Crown and chronograph pushers are knurled with a chrome ﬁnish. 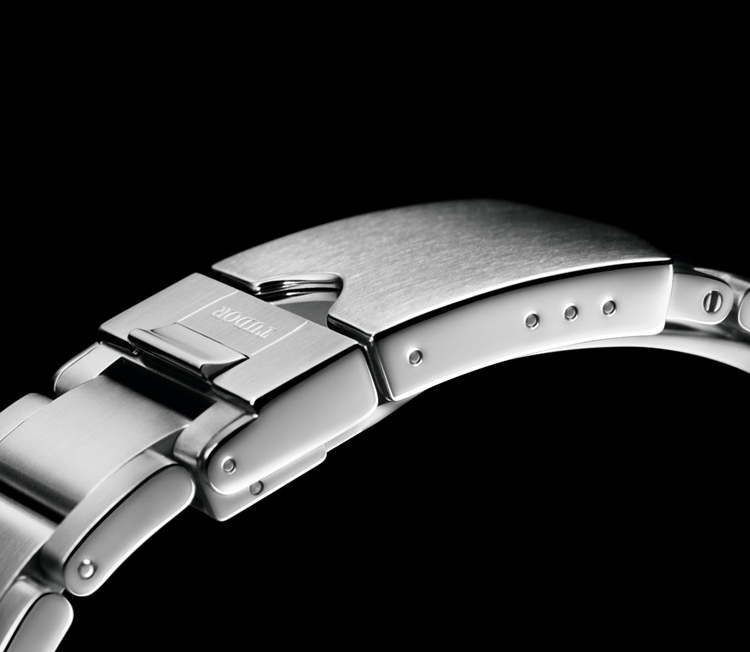 The self-winding movement, beating at 28,800 vph, delivers a 42-hour power reserve. 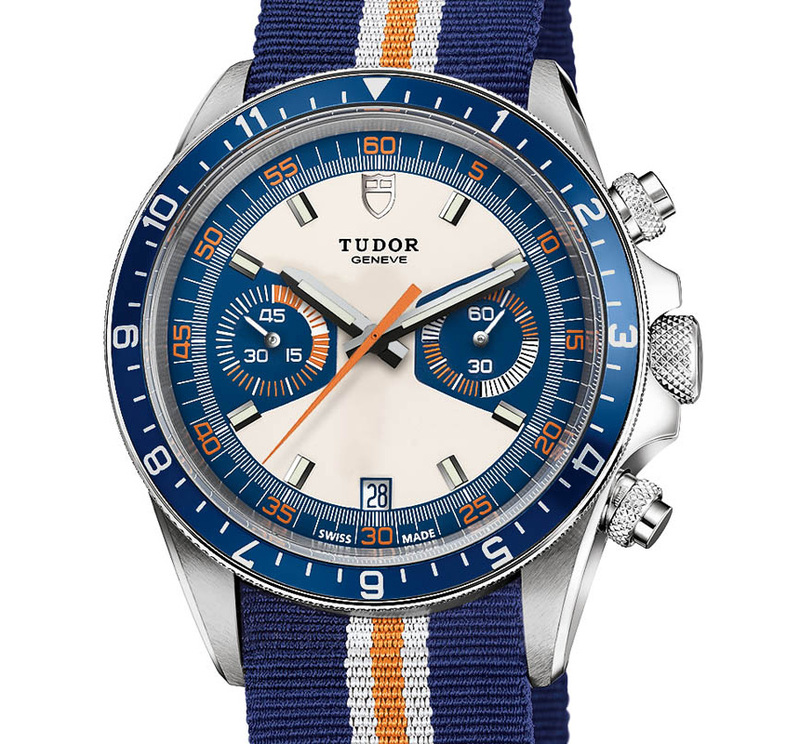 The Tudor Heritage Chronograph Blue comes with steel bracelet with folding clasp and safety catch and an additional fabric strap with buckle. At BaselWorld 2013, Tudor presented a reinterpretation of the 1973 "Montecarlo" chronograph. 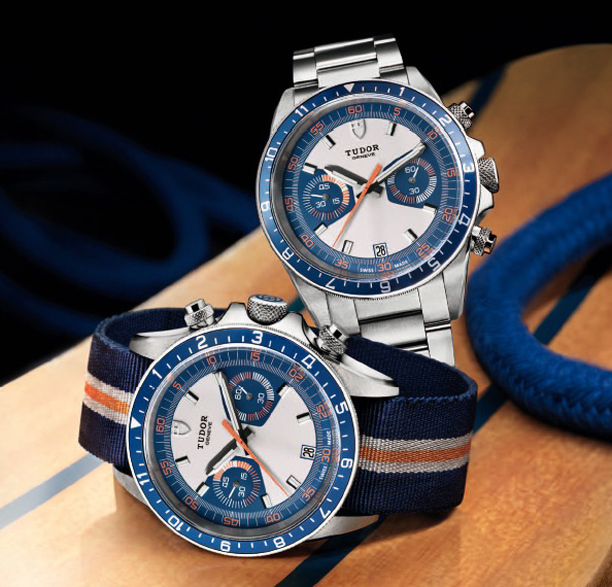 The new Tudor Heritage Chrono Blue (ref. 70330B) is defined by its vibrating colours, blue, grey and orange.